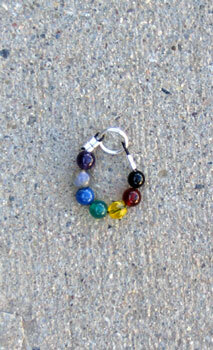 Harmonizing Gems…for our animal friends and people too! Harmonizing gems balance the vital energy centers of the body known as chakras by utilizing the healing qualities of each gemstone and through color therapy. Black Onyx – Grounding, transformational, prosperity, self -control, decision making, happiness, to absorb what is needed in all situations. Tiger’s Eye – Balances solar plexus, helps discernment, reduces stress, aids mental focus, soothing and calming. Adventurine – Helps us to avoid taking on “stuff” from others, decisiveness, follow-through, initiative, keeps us on track, light heartedness. Green Onyx – Centering, self control, mental stability, general balancer. Lapis – Releasing old patterns & programs, wisdom, clarity, courage, communication, deep healing on all levels. Labadorite – Intuition, transformational energy (“fairy energy”), conscious awareness of life purpose, strengthens auric field. Attachment ring for pet’s collar with breakable string for safety. 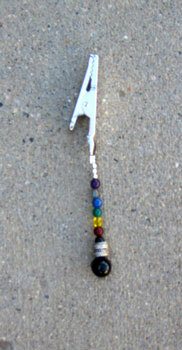 Pendant is 2″ tall and comes on a 3mm black adjustable cord. TO ORDER: Please call (805)245-9908 or send an email to info@kaarenjordan.com with the name of the pieces you would like & quantity, along with your name, address, phone number & time zone. We accept personal checks, money orders or credit cards through PayPal. Please allow up to 3 weeks for delivery and be sure to include your return shipping address and a phone number where we can reach you should we have any questions about your order.